Discovery Channel brings you the Naked & Afraid XL All Star of the Week Sweepstakes where they will be awarding to one lucky winner a Discovery Swag Pack that includes a Yeti Rambler Bottle (ARV: $55.00), Canvas Backpack (ARV: $40.00), and a Compass Bracelet (ARV: $5.00). Each swag pack’s ARV is $100.00, the total ARV for all 8 winners is $800.00. You must watch Naked and Afraid XL: All-Stars each Sunday and look for a special code word. 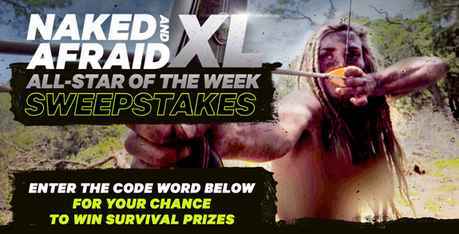 Once you have the promo code word now go to the sweepstakes page at www.discovery.com/win then enter the Naked & Afraid XL All Star of the Week code word and complete the entry form, to enter the Sweepstakes. A new Naked and Afraid XL code word will be displayed for each Entry Period. You must provide a code word to enter the Sweepstakes. One lucky winner will be announced each week. Note: Entries featuring an incorrect code will still be accepted so you can enter this sweepstakes without any code word. Who Can Enter: This Naked and Afraid sweepstakes is open only to legal residents of the fifty (50) United States and the District of Columbia who are twenty one (21) years of age or older at the time they enter the sweepstakes. When To Enter: The Discovery Naked & Afraid XL All Star of the Week Sweepstakes will begins on Sunday May 13, 2018 at 12:00 a.m. Eastern Time (“ET”) and ends on Tuesday July 3, 2018 at 11:59 p.m. ET. Sponsor: Discovery, Inc., One Discovery Place, Silver Spring, MD 20910. Sweepstakes Prize: Discovery Swag Pack that includes a Yeti Rambler Bottle (ARV: $55.00), Canvas Backpack (ARV: $40.00), and a Compass Bracelet (ARV: $5.00). Each swag pack’s ARV is $100.00, the total ARV for all 8 winners is $800.00. What’s the code for June 3rd? I watched it and never saw it. Was hoping you did.